See scan - absolutely perfect condition. This is a scarce and extremely rare seldomly seen Bulgarian Royal Police officer badge from the era right after the Russian Turkish Liberation War and after Prince Alexander I Batenberg became Bulgaria's first monarch after Bulgaria was freed from the Ottoman Turkish Empire. The bade is cast bronze and was attached to uniform. The piece is relatively large measuring 63mm x 45mm. Absolutely scarce militaria / military collector piece and Police related collector item. 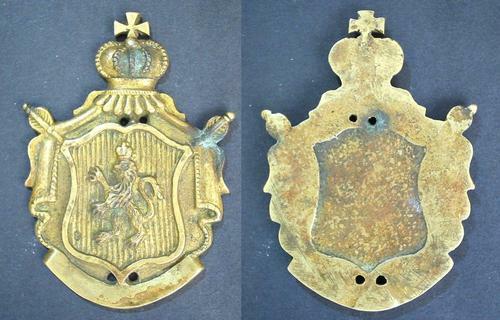 One of the rarest Bulgarian badges and decorations.